TFCM has a number of key projects which will enable us to support our families and children effectively. These projects involve either new building work or improvemnets to existing fascilities. A total of 16 orphaned boys and girls are housed through TFCM and are in the care of our partners in Kalagi. Some of our supporters raised the funds for us to buy a small house near our school. Work is in progress to extend and adapt the house to provide separate dormitories, bathrooms & toilets for the boys and girls, plus a kitchen and dining area. Also, in order to provide a permanent water supply to the house, we need to install a rainwater capture system which needs a storage tank, guttering and downpipes. The children are being housed in temporary accommodation until the dormitories, bathroom and toilets are completed, when they will be able to move into the house pending completion of the remaining building work. To comply with Ugandan government security requirements for vulnerable children, we have had to divert some of the house development funds raised so far into installing a steel gate and a perimeter security wall around the house site. 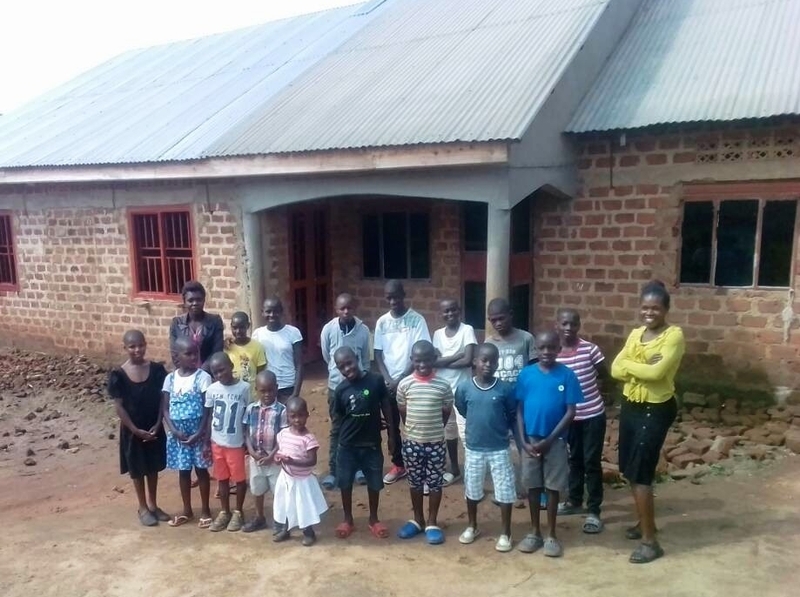 As at January 2018 we still need to raise £4,800 ($6,300 USD) to finish all the necessary work to turn the Children’s House into a safe and comfortable home. We have a small training centre attached to The TFCM office in Kawempe where we run training and education programmes for family guardians and young adults from within the local community. These are for family guardians and jobless young adults to equip them with the necessary skills for generating a regular income. Up to now we have focused on training in dressmaking and tailoring skills and employ a permanent trainer. For many of the older family guardians we provide a small starter fund for them to purchase materials to make craft items at home, especially baskets, mats, hats and jewellery items. These items are then displayed for sale in the craft display area outside the TFCM office. A range of training and counselling sessions are held at the training centre, mainly for the family guardians directly supported by TFCM. Increasingly, we are extending the training sessions to include younger parents within the local community, especially those who have previously failed to complete primary or secondary schooling. The Nursery and Primary School had 130 pupils in 2017, of which 50 are sponsored currently. Our aim is to secure sponsors for all of the children, to enable them to complete their primary education and for the school to have sufficient funds to maintain the necessary operating standards. We would love it if you decided to raise funds for a TFCM project of your choice. It takes just a few minutes to set up your own dedicated fundraising page for TFCM on give.net, where you will also find a free fundraising toolkit. Winston Churchill called Uganda 'The Pearl of Africa' and with good reason. It's a great place to visit for a vacation or gap year, or for a group visit combining a safari with a working holiday for which TFCM could provide the 'To Do' List! We would be pleased to discuss visit options with you including some suggestions for planning a trip to TFCM in Uganda.